Our newest release included some tweaks and improvements to our most important page: the banner preview page (see an example). 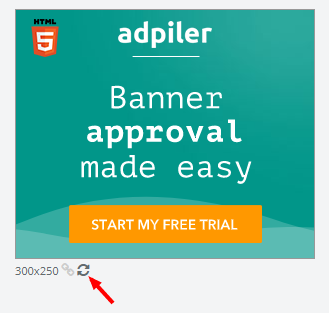 Most banner ads are animated for the magic 30 seconds. You had to reload the preview page to see the animation over again. Now you can easily click the refresh-icon to reload the banner and see the animation over again. The preview page contained 3 elements: your ads, a header and a footer. To optimize the viewability of your ads we’ve decided to merge functionalities of the footer into the header. We were able to remove the footer completely without changing the size of the header. Mainly for mobile and smaller laptop screens this will be a huge advantage.